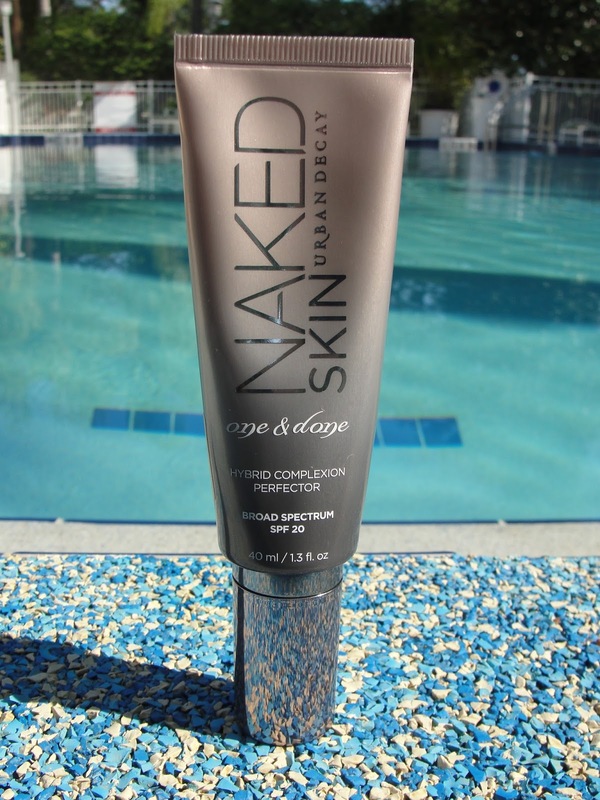 Today I´m reviewing the new Urban Decay Naked Skin one & done Hybrid complexion perfector. Geez- I don´t know why they always have to make such long names. Nobody is gonna remember that anyway! LOL! "Instantly blur imperfections and even out skin tone - for beautifully perfected, ultra definition skin. (Naked Skin One & Done gets the job done so well, there's no need for foundation.) UD's high-tech, weightless formula provides all-day wear and feels amazing. But the best part is how it transforms the look of your skin! Light-diffusing spheres instantly help make flaws seem to disappear. Over time, pores look smaller and skin appears noticeably firmer and more radiant. And the broad range of easy-to-match shades covers a wide spectrum of skin tones." I actually sampled this product before I went for the full size, because I was afraid this would not work on my oily skin: the packaging and the word "hybrid" in the product name made me assume this would be not a great fit for oily skin! But what surprise! This is actually a perfect match for oily skin and delivers a matte finish! 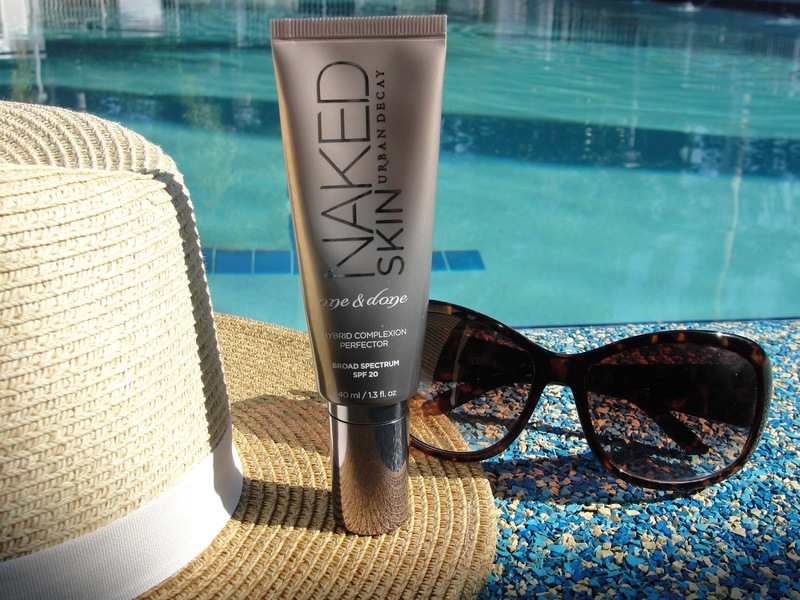 I love that it includes an SPF of 20- great not only for summer. 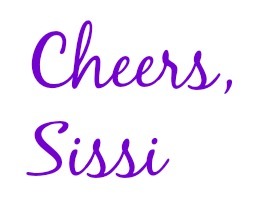 It feels so super light weight and is easy to apply. 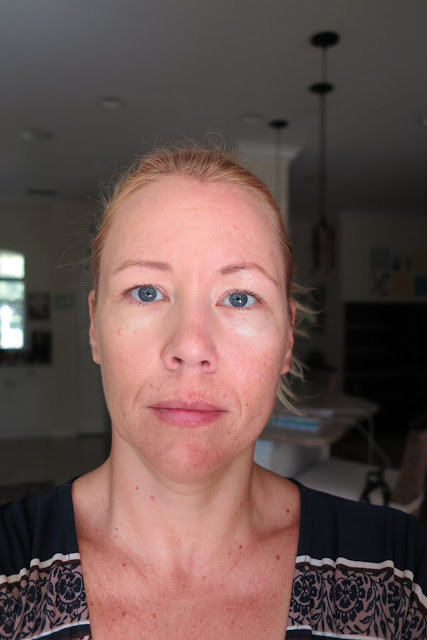 And I really noticed that this helps blurring out my forehead lines as well! Now to the bad part: there isn´t much coverage provided with this product. It is only a very light coverage- so if you have something to cover up, this product is not good for you! On this picture I used the Urban Decay One & Done only on my left side and you can barely see a difference to the other side. My biggest problem area is my chin and that barely got covered at all. It comes in only 6 colors- but since the coverage is so low, you are sure to find one that works for you. 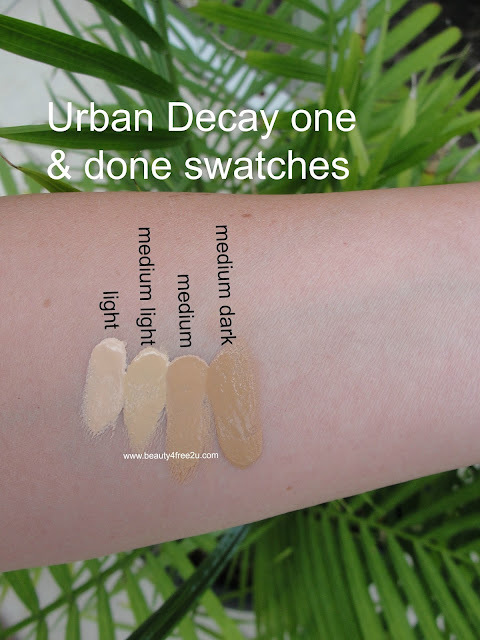 I have a couple of swatches for you! 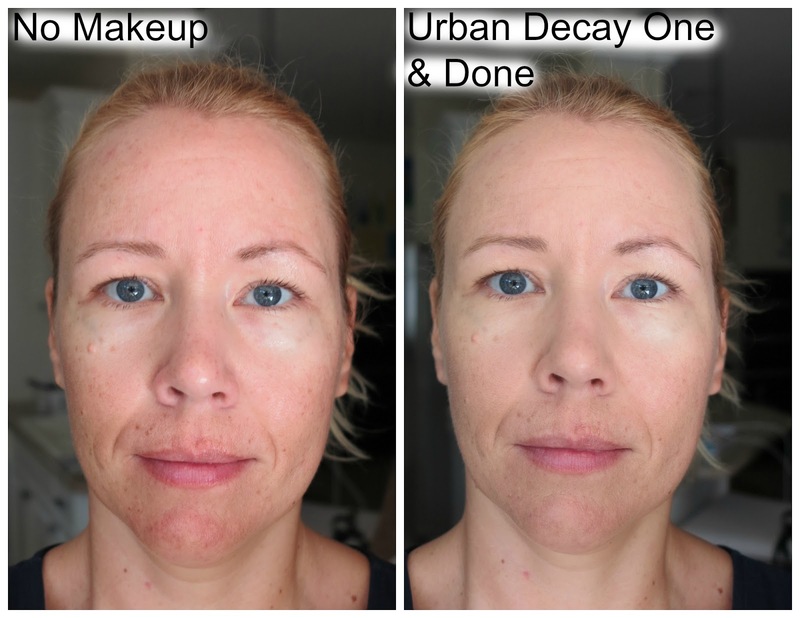 So the question for me is: what Urban Decay meant by "One & Done"? If this should mean: no need for an extra SPF or moisturizer and no need for a setting powder I say: true (at least for oily to combination skin)! But: if this should mean: no need for a concealer I say: absolutely not true! There is almost no coverage provided at all. You need to have a real good skin day to pull this one off! This is a great product- especially if you live in a humid climate like I do- if you are looking for a light weight product that includes SPF and gives you a little tint to the skin. It truly manages to give me also a little blurred effect on my forehead wrinkles and I really like the matte finish it provides and love to use it on relaxed casual weekends- so much that I bought the full size after sampling it! $34 seems like a reasonable price for the Urban Decay one & done! However: if you are looking to cover up a lot of blemishes and redness, this is not the right product for you and if you have dry skin, I don´t recommend this because it is not very hydrating and you will have to add a moisturizer which takes away from the point: one & done lol.